I recently took part in a beauty swap with Mary from Pure Makeup. I received my parcel last weekend and it contain some lovely goodies. Here is a list of what Mary sent to me - Indigo Wild Zum Bag, Livpurely Organics Coconut Oil Moisturiser with Vanilla, Priia Under Eye concealer Light/Medium, Auromere Ayurvedic toothpaste, St Dalfour Tea. Look out for reviews once I work my way through everything. Easter is fast approaching, thankfully I can now enjoy a dairy free Easter egg. As a child I was pretty miserable at Easter time, not always that impressed by my gift whilst I watch my sister gorge on eggs (sorry Mum!). 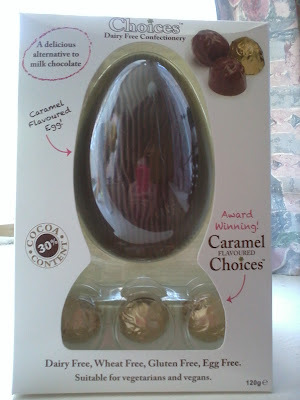 This year I have picked up (from Sainsburys) a Choices Caramel flavoured Easter egg. It is Dairy, Wheat, Gluten & Egg free, suitable for Vegetarians & Vegans. We all know I am not a fashion blogger. I rarely follow trends, I have curves, I am not a skinny minnie and I like comfort. 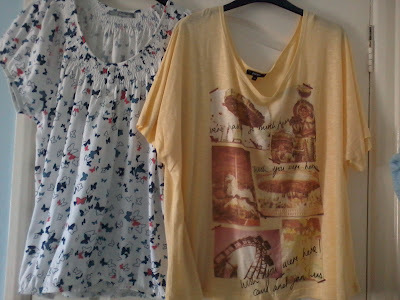 I thought I would share with you a couple of tops I purchased last weekend. 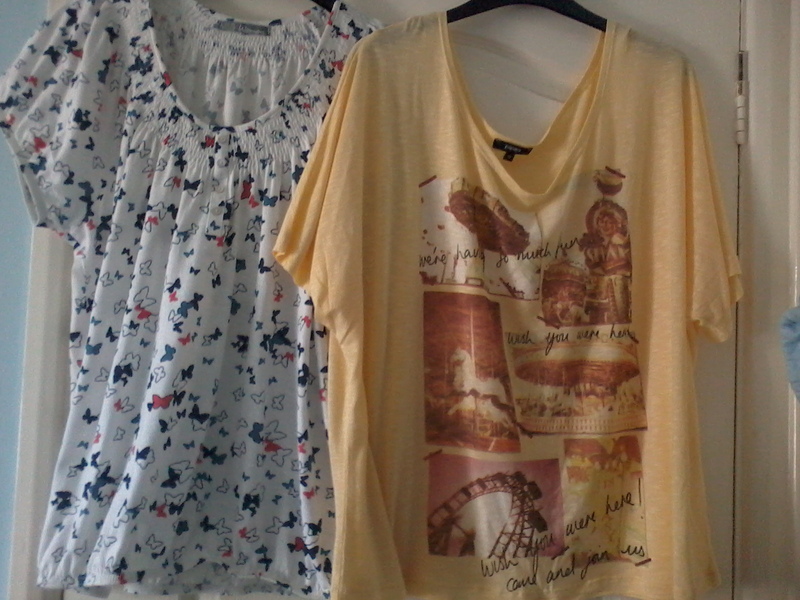 The one on the left is from Marks & Spencer (£12.50) and the one on right is from Matalan (£8). Alpro have some new products on the shelves one of which is their Fruity & Creamy yoghurt (Cherry or Peach flavour). 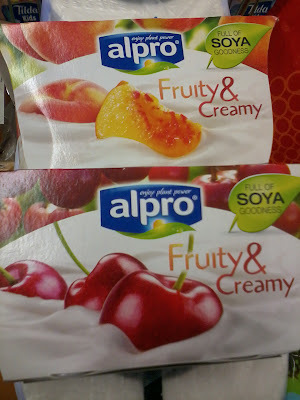 Whilst these are nice and tasty, unless I am missing the point, I am not seeing much difference between these and their other yoghurt. Yes the texture is a little thicker but as for fruitier, um I'm not getting that. You only get two pots in a pack for £1.19 whereas the four pack is £1.75 (I picked these up at Tesco). I think this sums up my week. I am currently testing out a number of new products I have purchased and been sent, so stick with me and look out for reviews. I hope everyone had a lovely weekend and I look forward to your comments. Yes yeast free is a tricky one, I was always told to avoid but I don't bother can't give up my beloved Vegemite. I also use the yeast free stock cubes. It's funny because I think Gluten Free has it much easier at the moment, the focus is on that and my dairy free is loosing out shelf space. Very nice haul! The range of dairy free Easter eggs is pretty pathetic. The supermarket where I work only stocks one brand and last year we sold out of the one variety a month before Easter. There really needs to be more dairy free choices available given how much intolerances are increasing these days. Good to hear that you won't miss out on Easter this year. Thanks for stopping by and leaving a comment. I only ever see dairy free eggs at one supermarket over here & it's the same problem they sell out fast, I always grab when I spot them otherwise I miss out.